It is with great pleasure that we announce the advancement of The Spicy Bowl of Robots to the Los Angeles Regional Championships for The FIRST Tech Challenge! Students had to present in front of 3 judges at the competition held in Perris comprised of engineers, scientists, and professors. There were only a few middle schools participating in the challenge, and Lennox Middle School made their mark! "Words cannot describe the pride we felt as we witnessed our students share their process and share their engineering design notebook," said Dr. Salvador Martin, Assistant Principal at Lennox Middle School. "It is a testament to the preparation they have received from all of their teachers. Mr. Duffy and Mr. Hernandez have done a great job coaching and mentoring our students. It was great to see over 10 parents that drove 2 hours to Perris. A special thank you to Mr. Anderson that came out and supported and cheered our students." 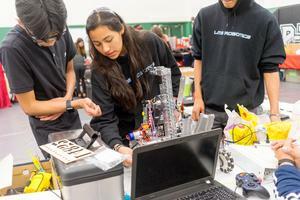 The FIRST Robotics Tech Challenge is for students in grades 7-12. Each year students who participate in the FIRST Robotics Tech Challenge are challenged with designing, building, programming and operating robots to compete in a head-to-head challenge in an alliance format. Guided by adult coaches and mentors, students develop STEM skills and practice engineering principles, while realizing the value of hard work, innovation, and working as a team. Learn more about their journey.